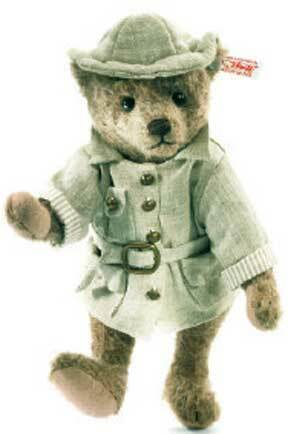 Margarete Steiff GmbH Limited Edition Teddy Bear handcrafted in Germany of fine Mohair, with "Button in Ear". Nando is sewn from finest russet-tipped batik mohair - a very unique fabric. He is a showcase of the airbrusher's art, with painting around his nose, eyes, and ears. Nando's nose is hand-embroidered in chestnut floss framed by black thread. His claws and mouth are also black floss and he is 5-way jointed. Stay on the right course with Nando and you will make the most of your time in Paradise Jungle. Steiff Nando Teddy Bear has a gold-plated "Button in Ear". Size: 12 inches. Color: Russet tipped. Handcrafted in Germany of Mohair, stuffed with synthetic filling material, with safety eyes. 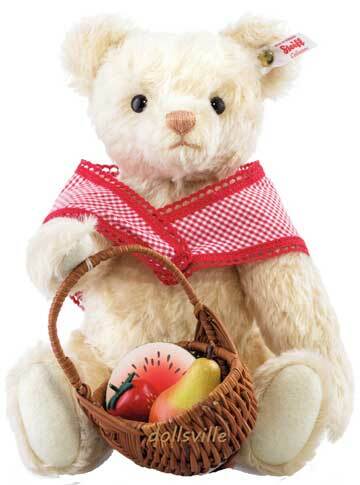 German toymaker Margarete Steiff started creating toy stuffed animals in 1880. From November 1904 onwards, every Steiff had a "Button in Ear".